The Toronto International Film Festival is the second largest film festival in the world. Hosting an audience of 400,000, featuring over 300 movies and lining the streets with celebs, fans and movie lovers. The festival is home to a diverse selection of films that cater to various tastes like vampire worshippers, walrus horror films (we know), historic tales, and epic world realities. A festival truth is that no-matter what you’re into the chances are somebody else is too. We wanted to help film lovers at TIFF find that somebody. We created, designed and built Film Hearts because venturing TIFF alone didn’t seem particularly festive to us. Film Hearts is designed to connect people with the same film tastes and ensure that great films never have to be seen alone. 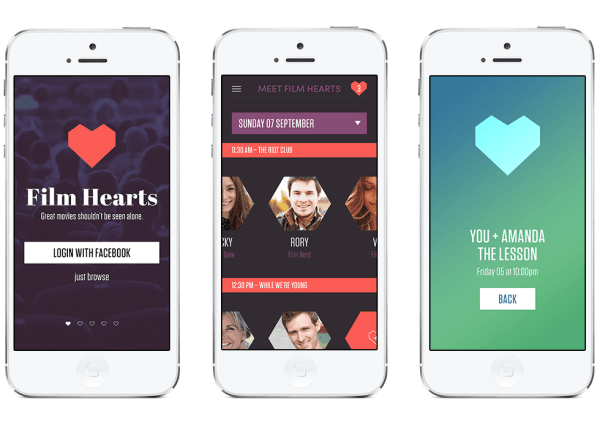 Film Hearts is optimized for mobile, which allows users to stay on track of show times, films and meet-ups. The user creates their own film-orientated profile, then browses others and instantly connects. While they are waiting in the lobby they can use their visual tag to identify themselves to their newfound movie buddy, film nerd, or fake date. We introduced Film Hearts to the world with some Bill Murray inspired pieces of chalk art and posters in TIFF’s concrete playground. We also ran film inspired posters on our social channels urging people to find their ‘other film half’. A few connections and great movies later, Film Hearts hit the online presses featuring in the Examiner.com, Adland.tv, Infopresse, Mediapost.com, and Strategyonline.ca. We hope this platform changes the lives of lonely filmgoers everywhere.